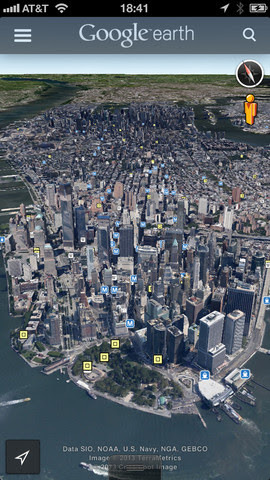 Arch rival Google yesterday updated its flagship App, Google Earth for the iOS devices. The Google Earth 7.1 released yesterday brings the street view to iOS users. It will also cover more than 100 countries now with India being one of them, under the street view option. The updated App will now have a new streamlined interface to enable users to view different worldwide destinations including the likes of Stonehenge in Street View or the Chicago skyline in 3D. The update also brings about new changes to interface. Clicking on the Earth logo in top left now allows users to access more information through layers like Wikipedia and Panoramio Photos. For those who’d like to explore these regions themselves, the app claims to feature improved directions too, to let them visualise step-by-step transit, walking and biking directions in 3D. The Google Earth app for iOS devices is compatible with iPhone, iPod touch, and iPad with devices running of iOS 4.3 and higher. Download this must have App from Apple Store now.